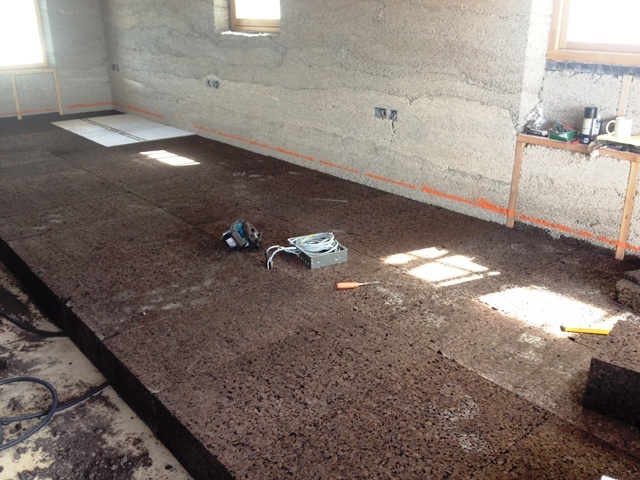 Generally expanded cork is used to insulate the roof or walls of a building, but it can also be used to insulate the floor of a building, which is the case for a client we recently supplied in the UK. 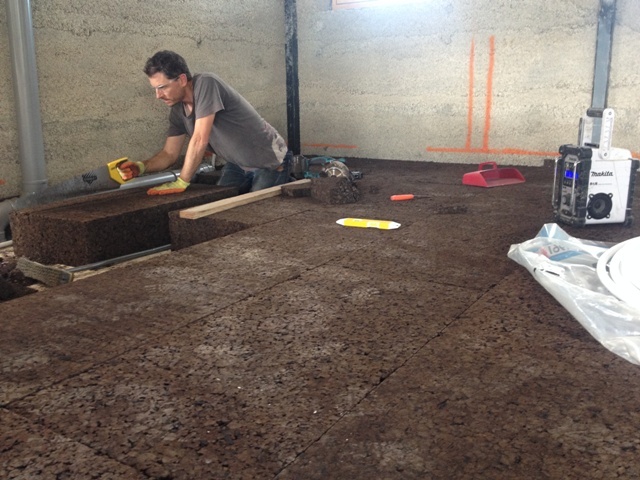 This client is trying to build a truly environmentally friendly house and chose expanded cork as the most effective, 100% environmentally friendly insulation product. Expanded cork is made from the bark of the cork oak tree, and when the bark is stripped, the tree does not die, bus slowly regenerates the bark to be harvested several years later. The cork bark is then granulated and under pressure and heat, resins are released by the cork granules, which bind them together to make a block. These blocks are then cut to size to make expanded cork boards. So the product not only helps to preserve Portugal’s fabulous cork forests, but is also 100% natural in origin. Above you can see our client using 200mm thick cork boards to insulate their floor, after which they will add a lime slab on top. You can see that it is easy to cut expanded cork to shape with a handsaw if needed; you can also see that the cork itself has an attractive organic look and in some cases the expanded cork is left exposed on a wall to give a unique look to a room. If you are interested in using expanded cork to insulate your building, please contact us at CorkLink.